This recipe for Sephardic Spinach and feta cheese kefters are great alone and also good topped with a simple cucumber Tzatziki Sauce. I first tried out these cheesy fried delights one Chanukah. Now we keep them in the freezer as they make a great lunch or light dinner along with a bowl of soup and salad. 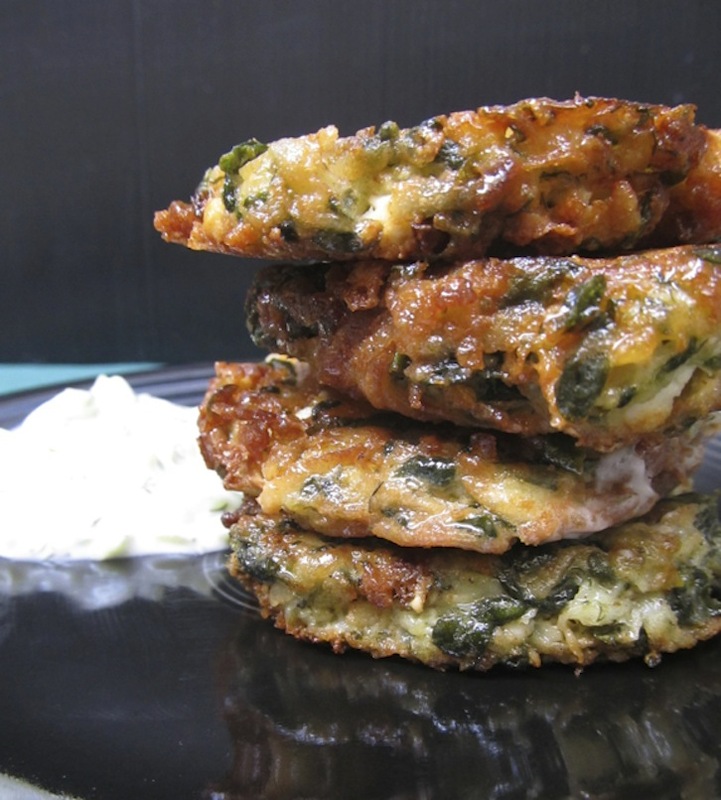 QITK tip on how to make the best Chanukah latkes apply to these Sephardic Spinach fritters, too. 1.Finely grate potatoes using the small holes on a hand held grater. If using a food processor, after grating, pulse the potatoes with the blade until fine but not pureed. 2. Place grated potatoes in a large bowl. Using your hands, squeeze most of the water from the potatoes into the same bowl and place squeezed potato into another bowl. Pour off most of the starchy water from the first bowl, but reserve 2 to 3 tablespoons from the bottom and add back into the potatoes in the second bowl. 3. To the potatoes, add green onions, eggs, flour or matzoh meal, dill, lemon juice, spinach, salt and pepper. Mix well. Add more flour or matzoh meal as needed until you can shape a loose ball with the mixture. Fold in crumbled feta cheese. 4. Place a large skillet over medium high heat. Pour in oil to reach 1/4 inch. Test by dropping a small amount of the mixture into the oil. When it sizzles the oil is hot enough. Gently mound the mixture in a tablespoon measure and place into the hot oil. Flatten gently with a spatula or spoon. Cook 3 to 5 minutes depending on size, until golden and gently flip to brown the other side for another 3 to 5 minutes. In a medium bowl combine cucumbers, sour cream and dill. Mix well. Cover and refrigerate until serving. 5. Remove spinach and cheese latkes to drain on paper towels set over sheets of newspaper. Serve immediately. To Freeze: Place cooked spinach kefters in one layer on a baking pan in the freezer. When solid, remove to a plastic freezer bag and seal well. They will keep for up to 6 weeks. When ready to serve, place frozen spinach kefters on a baking pan and pop into a preheated 400 degree oven for 10 minutes. Sauce will keep for one week, covered in the refrigerator.